Dental caries, more commonly known as cavities, are areas of the teeth that have been damaged due to bacteria. For most, cavities lead to sensitivity and pain, which requires a filling by a dentist to correct it. Certain lifestyle choices and behaviors lead to more cavity-prone teeth. The upside is that, when you know what they are, you can take steps to prevent cavities in the future! It goes without saying that if you don’t brush and floss your teeth, you’re more likely to develop cavities. These are basic but necessary steps to preserve your oral health. When you skip brushing or flossing, you give bacteria time to grow and harden into plaque on your teeth. Colonies of bacteria leave behind acidic waste that wears away at your teeth. Brushing not only removes this waste but removes bacteria to prevent plaque from forming in the first place! Flossing does the same for surfaces on your teeth that a brush can’t adequately reach. Your diet directly impacts your oral health. If you eat or drink foods high in sugar or with acidic content, you’ll have cavity-prone teeth. Sugary foods are a favorite source of sustenance for bacteria in your mouth. When they feed on sugar, or carbohydrates, they’ll generate more of the acidic byproduct you need to brush or floss away. 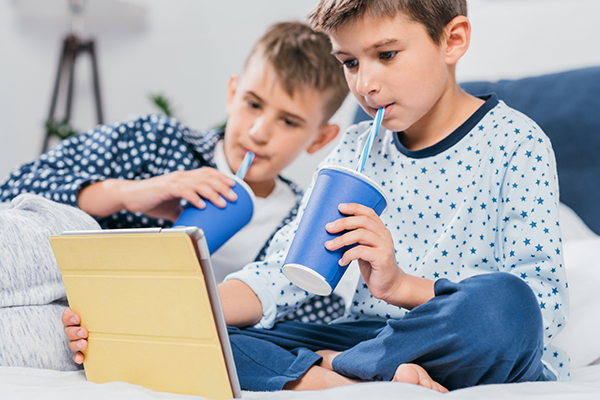 Carbonated beverages are another common cause of cavity-prone teeth. In addition to typically having sugar, acids in these beverages wear away your tooth enamel. Without this protective enamel coating, it’s easier for cavities to form. One condition that can lead to cavities is dry mouth. Chronic dry mouth is typically a side-effect of other conditions, such as from medication. Other causes of dry mouth can be more immediate, like after drinking alcohol or smoking. Dry mouth creates an environment that’s ideal for bacteria to live and multiply. If you have dry mouth, you need to take extra care to brush and floss completely, as your mouth will be more prone to cavities than those with adequate saliva production. If your dentist mentions that your gums show signs of receding, beware! Your chance of developing cavities increases the more your gums recede. The simple fact is the less area your gums are covering, the more likely it is for bacteria to wear away at your teeth. Additionally, gum loss can create additional gaps that are extremely difficult to brush or floss. These are the best hiding places for bacteria or food particles, leaving your mouth open to acidic attacks. Can You Be Born with Cavity Prone Teeth? If your teeth don’t have sufficient enamel, or lack enamel entirely, it may be due to enamel hypoplasia. This condition can be present in children, especially those who were born premature. It can affect both baby teeth as well as permanent teeth. While poor dental care in normal teeth will result in the loss of enamel over time, those with enamel hypoplasia will already have little to no protection for their teeth. Without this enamel, they’re far more likely to develop cavities or experience other issues with their teeth, like cracking or chipping. Perfectly straight teeth are rare! Most people are born with some slight irregularities with their smile. While not everyone is recommended for orthodontic treatment, many will be. There are many side-effects of crooked or crowded teeth, but one of them is an increase in cavities! In perfectly straight teeth, a toothbrush and floss are easily capable of reaching essentially all of the major surfaces in the mouth. But when your teeth have extreme angles or block access to each other, they create ideal spots for bacteria. Thorough brushing and flossing just can’t hit every angle in some mouths. This is one reason that it’s recommended for children around the age of seven to be evaluated for orthodontic treatment. It’s much easier to prevent long-term oral health issues due to crooked teeth when the process is started earlier. You’ll hear it one thousand times, but that’s only because it’s so important. Daily brushing and flossing is the best way for you to keep your oral health under control. Outside of visiting the dentist every day, it’s the most effective way to remove bacteria and protect your enamel from eroding. And yes, flossing is absolutely necessary. Without it, you’re completely ignoring the sides of your teeth – the area most likely for bits of food to get trapped! Not only can this food literally rot away in your mouth, it will provide sustenance for bacteria. You’ll never know how bad the damage is until your dentist informs you – and by then, you may need more than a string of floss to fix the problem. If you make an effort to minimize cavity-causing foods in your daily life, your dental health will improve dramatically! This includes sugary foods, citrus fruits and acidic drinks. That isn’t to say you can’t have them at all, but it’s important to moderate your consumption and to consider long-term effects. When you do eat these foods or drink these beverages, try to follow-up with a glass of water to help wash away any residual sugars or acids. Keep in mind, you don’t want to brush right after having a soda or acidic food! They leave your enamel weakened, and brushing can do more harm than good. Rinse with water and brush around 45 minutes later. Going to the dentist can be stressful, but it’s important, especially for those that have cavity-prone teeth! Not only will you get a thorough teeth cleaning, your dentist can identity problems and even let you know where you need to brush or floss better. Preventing cavities is far easier than fixing them – especially when we’re talking about your permanent teeth! This entry was posted in Dental Tips, Kids Oral Health, Preventative Dental Care and tagged children's dentistry, dental care, preventative dental care. Bookmark the permalink. Follow any comments here with the RSS feed for this post. Both comments and trackbacks are currently closed.